The white background means peace. The circle means harmony, the dark scarlet of upper part of the circle means the rising sun, the bird in the center of the circle is a sea gull (symbol of Pusan) representing Pusan City and the dark blue of the lower part of the circle means sea and Oryookdo which is the symbol of Nam-gu. 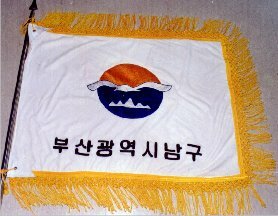 The flag shows Nam-gu to be part of Pusan City and the shining sun and the flying sea gull mean the strong and limitless development of Nam-gu.